You can make a powerful router out of an off-lease Enterprise Thin Client machine and a server-grade multi-port Ethernet adapter. Thin Clients are small, quiet, and power-efficient computers that are used as graphical terminals in enterprise networks. You can convert a "retired" Thin Client machine into a router. A typical home or office router has a tiny system-on-a-chip (SOC) that uses some software/hardware trickery and one physical network adapter. Instead of that you can have a Thin Client router that's an actual router with a powerful (for a router) CPU and multiple server-grade networks adapters. Your Thin Client router can run OPNsense or IPFire, for example. Both are are well-suited to the task. Update (Summer, 2018) - pfSense has dropped 32-bit processor support and soon will require a CPU with AES Instructions because pfSense is moving toward a cloud-management model. OPNsense (https://opnsense.org/) is a fork of pfSenese that supports 32-bit CPUs and doesn't require AES Instructions for a commercial cloud-based back-end. SmallWall (http://smallwall.org/) is a small and lean firewall that's also based on M0n0wall. (*) The VU902AA model has WiFi you'll rarely in this device (unless you think it's a good idea to have WiFi access to your border host). This machine was our top recommendation for years when pfSense was the recommended OS. Our recommended minimum specifications at that time were 32-bit CPU, 2GB of RAM, and 2GB of flash storage. It's still very capable of running OPNsense from a flash drive. A router made from an HP T5740 Thin Client can handle up to 650-megabits of throughput without adding significant latency. The T5740 has a 1.66 GHz Intel Atom CPU and comes with various RAM and ROM capacities. A chassis expansion module adds a PCIE slot and doubles the width of the device. A one-, two-, or four-port server-grade network card (full-height bracket) will fit into the PCIe slot. Price per port is about $8, which is astoundingly low. For example, the t5560 runs Windows XPe while the t5560w runs Windows Embedded Standard (WES) 2009. Similarly, the t5740 runs WES 2009 while the t5740e runs the new Windows Embedded 7 Standard. The hardware is identical, only differing in RAM size, flash size of the DOM, and the OS type encoded in the BIOS. There's also model-specific information about the T5740 on that site. 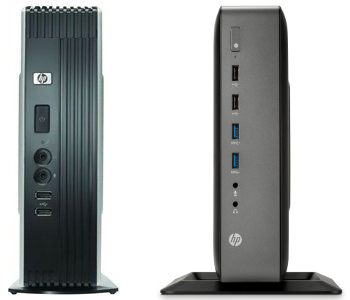 The HP T620 Plus is a newer Thin Client machine with a 64-bit CPU that has AES Instructions. The T620 Plus was made to run Windows 7 rather than Windows XP. The "Plus" version of the T620 has an expansion slot you can use for the network card. Choose one with 2GHz CPU, 4G RAM, 16G of storage, and an AC adapter. The expansion slot is Low Profile.